Each new year, instead of making resolutions, I like to put together a bucket list of things I'd like to experience - this is just a snippet of the beauty section of my 2016 bucket list! I didn't quite manage everything on last year's list, but I did try half of the brands I mentioned (including Pai Skincare, CV Skinlabs, Suki Skincare, Therapi Honey Skincare and Scotch Naturals) and I made quite a few new DIY products too! My list this year crosses over a little from the last and includes a few more brands I've been meaning to try along with a couple of beauty-related tasks to complete! Visiting Content Beauty was on last year's list, but since I don't live close to London and had limited transport it just didn't happen! I've got two definite trips to London already planned this year though so I will finally be visiting Content and, of course, there will be an obligatory trip to Whole Foods too! I also plan to browse the NEOM store and scout out the smaller selection of green beauty at Liberty and Selfridges - I've never been to either before so that will be an experience in itself! Last year I felt like I became a more conscious consumer as I gradually began downsizing my beauty stash. I think it's important to think not only of the natural/organic ingredients but also consider the environmental effects of excessive consumerism and the impact of marketing too. It's something I've always been a bit conflicted about, but I only recommended products that I've exclusively trialled for a good few weeks and actually enjoyed using, so, although this results in fewer blog posts from me, I hope you guys can appreciate I only want to give my most accurate opinions! I still have more skincare products than I need, so the aim is to reduce my collection even more this year! Although I've been engaged to my other half for almost 3 years, we're only just starting to make plans for our 2017 wedding! Of course I want to stick to all green/natural makeup products, but longevity can sometimes be an issue, so I'll be trying out samples throughout this year to find products that last well and are easy to reapply without looking cakey or overdone. Inika are my current favourite makeup brand but I would love to hear what your favourite makeup products are and if you have any suggestions you think I might like! 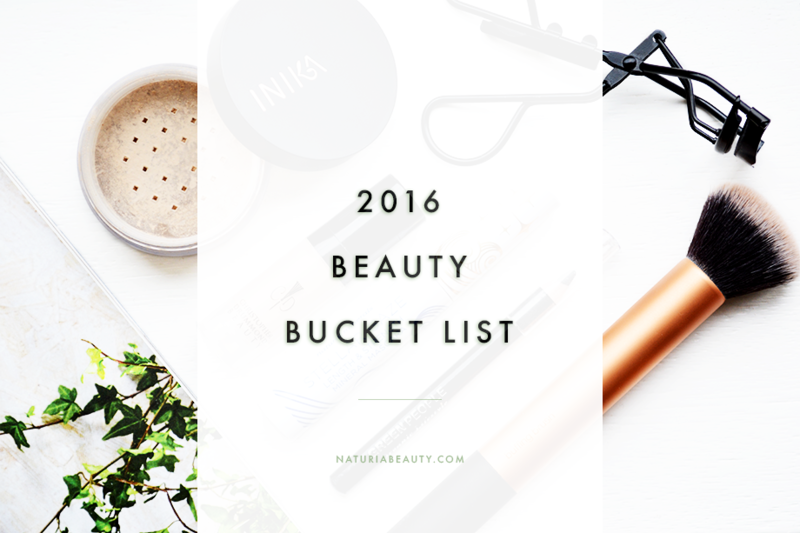 What's on your beauty bucket list for 2016?